We started off our Saturday de-cluttering and organizing!! There is so much to do in our home and since hubby and I both work full time, we agreed that every Saturday, we would work on projects from our 2013 (renovation) new years resolutions list and Sunday's would be our day to relax. The best part of hubby being so handy, is that we don't have to pay anyone to do it for us!! So yesterday, I did laundry and worked on my 2013 Project Life album (that's my way of relaxing lol). I will be sharing weekly updates of my pages in pictures. I will try and get monthly videos of my album up the first week of every month for the prior month in review. Those will also be posted here on my blog. As some of you may already know from prior posts, I subscribed to the Studio Calico Project Life (SC/PL) monthly kits. I am waiting for it to ship but in the meantime, I will use what I have. The papers are all from the American Craft Hip Hop Horray collection. The kraft cardstock is from Papertrey Ink. 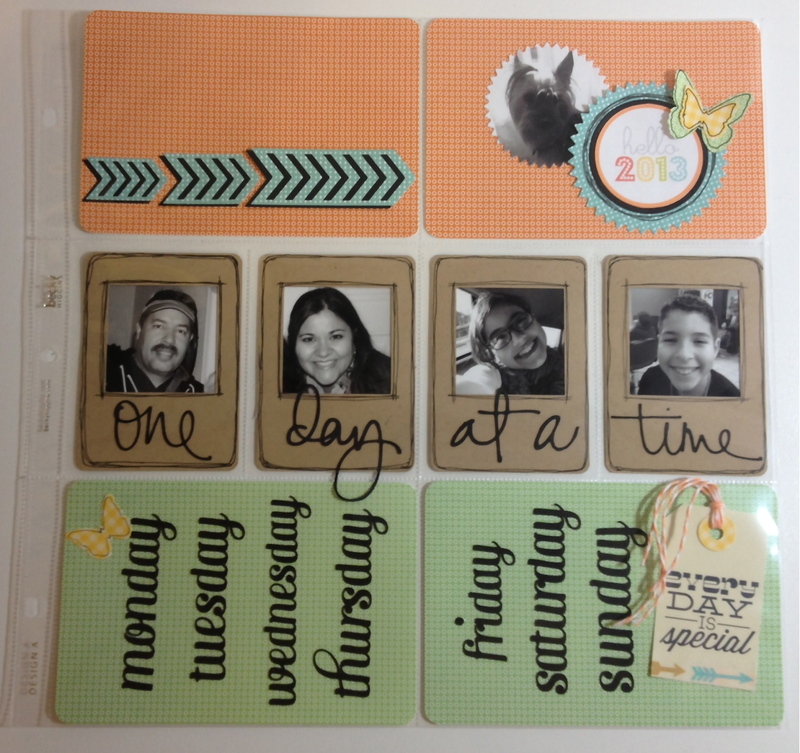 The print and cut "Hello 2013" and "Every day is special" tag, are from the January SC/PL digi kit. As for my die cuts....these are all from Kerri Bradford. I absolutely LOVE Kerri's designs. I recently purchased the Thirty One Days collection, Life Additions: Weeklies #2 collection and the Today collection which I used on this page. The arrows on the top left hand corner cell are also from the Life Additions: Weeklies #2. I added recent pictures of us, from our mini December get away, to the polaroid die cuts I created in my Silhouette. Our family would not be complete with our dog "Cutie" so I added a picture of her too. I used my pinking circle nestabilities to cut her picture out, as well as the back shape to the "Hello 2013". Just in case you're wondering why I added the days at the bottom of my page starting with "Monday", it's because that's exactly how my weekly entries will be. I love to do my Project Life pages beginning with "Monday" and of course, "Every day IS special" so I just HAD to add that tag to this cell. Hope you will join me on my 2013 Project Life journey!! Love how the pictures look! Great idea for the house too, I know it's such a blessing to have a hubby not only handy, but willing too.